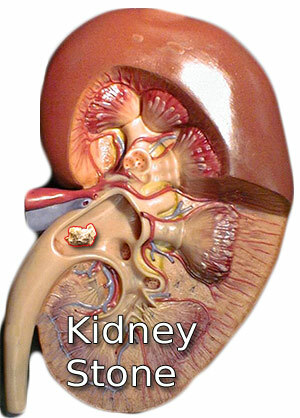 A kidney stone or renal calculus is a crystal concentration formed in the kidneys. Nephrolithiasis is formed from the minerals consumed in the diet and is largely composed of calcium. 75% of kidney stones are calcium stones. While Struvite stones are more commonly noticed in women, Uric acid stone can occur in men and women. Typically men are more affected by kidney stones than women. In most cases, the kidney stones are expelled by the body in the urine and no symptoms are noticed. But as the kidney stone grows in size, it can lead to pain and other symptoms. This is because of the obstruction to the ureters. A person suffering kidney stones feels pain in the area between the ribs and hip or lower abdomen and groin. Intermittent pain or renal colic is felt in spasms. It is sometimes accompanied by fever, blood and pus in the urine and pain on urination. There might be nausea and vomiting. There might be abnormal color of the urine. Some foods that might increase the risk of kidney stone formation are refined sugars, sodium, vast quantities of animal protein and cola. Inadequate consumption of water adds to the risk factors. Those taking calcium supplements might also notice higher incidences of renal stone formation. This does not happen with high consumption of dietary calcium. Sodium, Uric acid and sulfurous amino acids also contribute to the formation of kidney stones. On the other hand, magnesium and potassium reduce urinary crystal formation by excreting citrate. Those with a family history of kidney stones are at higher risk of renal stones. Persons suffering kidney disorders, UTI and cystic kidney disease are also susceptible to kidney stones. Hyperoxaluria is a condition where the body produces too much oxalate. When this quantity is too large to be dissolved in urine, it leads to the formation of renal stones. Ultrasound is done to confirm the presence of kidney stones. X-rays and IVP (intravenous pyelogram) aid in imaging the renal stone. Kidney function test and blood tests are also done. The size of kidney stones can range from a small grain of sand to a pearl. It can be smooth or jagged. Over time, renal stones can cause irreversible kidney damage. Most small stones in the kidney do not need treatment or removal. But if the kidney stones cause urine blockage, bleeding, infection or keep growing in size, they need to be removed. Some kidney stones, especially those consisting of uric acid or cystine can be treated with medicines. Else endoscopic removal of kidney stones with a uterescope is done. Lithotripsy is often used to break the stone into smaller pieces so that they can be flushed with the urine. Ureteroscopy is a common urological procedure administered in patients having urinary tract and bladder related disorders. Ureteroscopy is recommended for patients having kidney stones. The movement of the renal stones is monitored by urologists. Ureteroscopy is a minimal invasive endoscopic procedure predominantly involving the urethra, upper urinary tract and the urinary bladder. A flexible or rigid form of telescope is passed through the urethra in order to view the affected region. The procedure is performed under general or spinal anesthesia. The telescopic examination of the ureter and associated organs reveals the exact location of the stone and also other disorders of the system. Other diagnostic tests such as X-rays, CT scan, EKG along with laboratory parameters like urinalysis and complete blood count also help in the effective determination of the underlying condition. This technique is usually followed by the other associated procedures such as lithotripsy in which laser beams are administered to the affected region to dissolve the calculi(stone) or to clear urinary tract strictures. The entire procedure may last from 30 minutes to three hours and patients are advised to stay in the hospital for a day. The urologist uses the uterescope to remove small kidney stones while larger stones need to be broken up before removal. A kidney stone that has escaped from the kidney and got stuck in the ureter can be pushed back into the kidney. Here it has to be broken into smaller pieces to aid removal. A stent is usually left in place to allow the kidneys to pass the urine to the bladder. This is kept for a few days in case there is swelling and subsequent difficulty in draining the kidney of the urine.